* Provides balanced, in-depth coverage of the entire history of social studies education in the modern era, from the late 19th century to the present—the first book of its kind. * Analyzes the underlying historical, societal, and cultural contexts in which the social studies curriculum has evolved over time. * Addresses the failure of social studies to reach its potential for dynamic teaching due to a lack of consensus in the field. 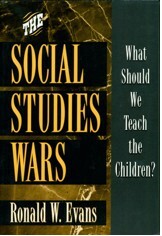 * Links the ever-changing rhetoric and policy decisions to their influence on classroom practice. * Informs all participants of both current and future negotiations, helping to clarify the meaning, direction, and purposes of social studies instruction in schools.